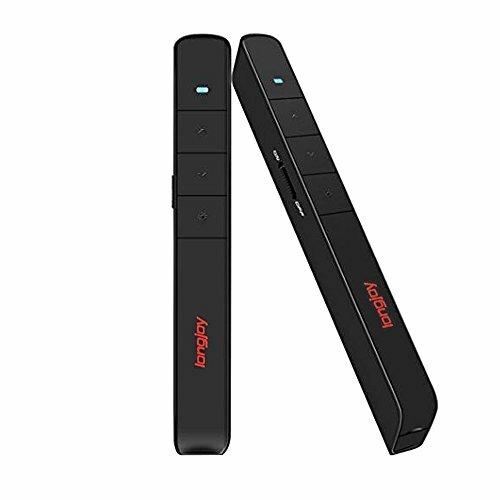 Longjoy wireless presenter is an essential tool for presentation, teaching, demonstration or office meeting; Easy to Use - With a red laser pointer the presenter is perfect for speakers, students, teachers, lecturers when it comes to delivering talks & presentation. It has all the functions you would expect and is super easy to use without the need to take your eyes off your audience; Environmentally friendly ABS plastics; Scientific ergonomic design that looks very stylish, small and exquisite, just like a pen.very comfortable to hold on; Lightweight and sleek, so it's easy to carry around in a pocket and feels good in your hand;Note: Please be noticed when you use it to point to LED or LCD screens, the red beam will be reduced. Longjoy Wireless Presenter combines the functions of a light , page up, page down, play slides, black screen for PPT presentation;One-touch keys easy to control slideshow;This Wireless Remote Laser Pointer Presentation is small and exquisite, portable and with richer applications. Low power indicate;Energy-saving;One-piece design, environmentally friendly ABS plastics; supplied through an AAA battery, swift and easy change, high availability. The laser pointer built-in docking bay in wireless transmitter tail to store USB receiver for easy pack up and portability, USB stays secured into place with a magnet system, there's no software to install. 2.4G universal channel. An essential nice assistant for demonstrations or presentations, easily use it in any corner of classroom. Making demonstrations or presentation seen more dynamic and making listeners feel release.Lightweight and compact, fit into your pocket or handbag.